In an apparent acknowledgment of the plummeting standard of public scientific education in the West, the UN's nuclear tentacle today unveiled a new danger sign for radiation which must approach the nadir of literalism. The International Atomic Energy Authority said its new sign, developed in collaboration with the International Organization for Standardization should be taken up worldwide ASAP. Spokeswoman Caroline MacKenzie summed up the new stance against Darwinian natural selection, and in favour of Homer Simpson: "We can't teach the world about radiation, but we can warn people about dangerous sources for the price of sticker." 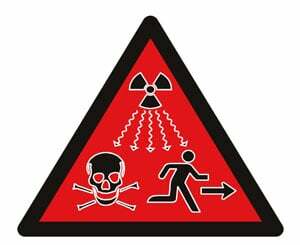 So, as well as the traditional exclamation mark trefoil, a skull and crossbones is there to belt and braces the fact that radiation isn't nice. Any dunderheads then unsure of what to do in such circumstances are further helped out by the addition of the image of a running stick man. Who's the guy that just got sued for invading privacy? M-I-C-K-E-Y M-O-U-S-E!